Veterans have attended a special lunch on the 68th anniversary of the D-Day landings. Veterans from the D-Day landings are being hosted at a lunch on board HMS Belfast today. The ship has only recently been re-opened to the public after the gangway collapsed into the River Thames in November 2011. HMS Belfast re-opened to the public last month. Credit: London Tonight. Chains on the deck of the ship. Credit: London Tonight. A close-up of the ship's arsenal. Credit: London Tonight. D Day Veterans arriving on ship. Credit: London Tonight. 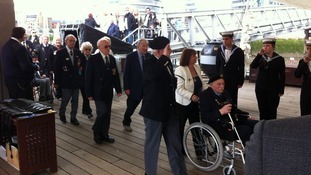 D Day Veterans from Hillingdon are piped aboard HMS Belfast on the 68th anniversary of the Normandy Landings. They are attending a special lunch on board the ship.